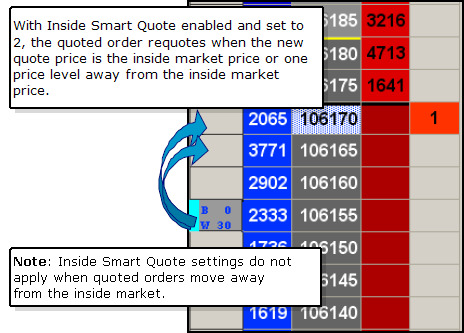 Like Slop, the Inside Smart Quote reduces excessive quoting away from the inside market. When enabled, your legs only requote when they are a set number of ticks away from the inside market. You determine what that number is for each leg in the spread. Disables Slop and Advanced Slop when enabled. Does not prevent requoting when order price moves away from the inside market. 1 Quotes do not adjust toward the inside market unless the new quote price is the inside market. You are quoting (n-1) ticks away from the inside market. Your quotes move when they are within (n-1) ticks of the inside market. The smaller the number (n), the less movement and extraneous quoting in your spreads. Example 1: When set to 2, Autospreader adjusts the quote order price when the price is the inside market and one tick away from the inside market. 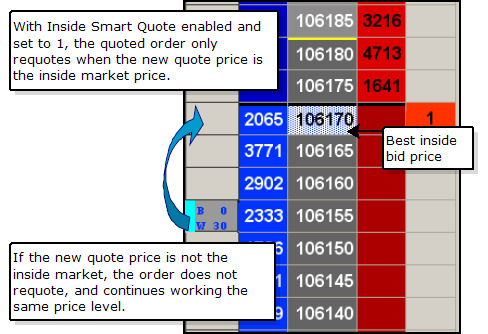 Example 2: When left at the default of 99, Autospreader adjusts the quote order price at every price level 98 ticks away from the inside market. In the Autospreader Manager window, click a spread in which you want to use smart quotes and click Edit. Click the Slop Settings field and click Inside Smart Quotes. The Inside Smart Quote row appears under Basic Properties. In the Inside Smart Quote field, type the number ticks you want to set for each leg. You successfully set the inside smart quote.